We strongly encourage using public transportation if possible. We will be providing valet parking for our guests. Pull to the curb in front of the library and look for the guys in yellow polo shirts. The valets will be leaving at the end of the night, so if you intend on staying out or you're in no condition to drive, make sure you get your key from them. You'll be able to get your car from the parking lot two blocks to the right of the library for no extra charge as long as you pick it up on Sunday. If you insist on parking your car yourself, there are a number of metered parking spots in front of the building and on the surrounding blocks. There are four parking garages within two blocks of the library (click on the minus sign to zoom out and see more). Take the train to the last station (15th-16th & Locust Street), which is connected underground to the SEPTA Walnut-Locust station. 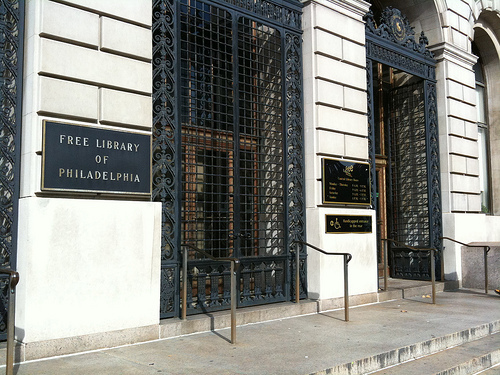 Take the Broad Street Line to Race-Vine station and walk down Vine Street to the library at #1901. The Keystone and Acela Express lines go directly from New York Penn Station (NYP) to Philadelphia 30th Street Station (PHL). From 30th Street Station take the Media/Elwyn (R3) Regional Rail line towards Center City to Suburban Station (the next stop). The Embassy Suites is two blocks north of that subway station. The nearest stations are Race-Vine and 15th and Market. Click here for a clickable map of the subway system. Google Maps provides pretty good directions for using public transit (choose "by public transit" in the drop-down box). They're not as prevalent as they are in New York City, and they're not all bright yellow, but you should still be able to find a taxi on the street fairly easily. If you're coming by plane you will of course want to fly into Philadelphia International Airport (PHL). The airport isn't large enough that there's a tram for traveling in between terminals, but walking from A to F is still no picnic so be cognizant of where you are and where you need to be picked up or dropped off. 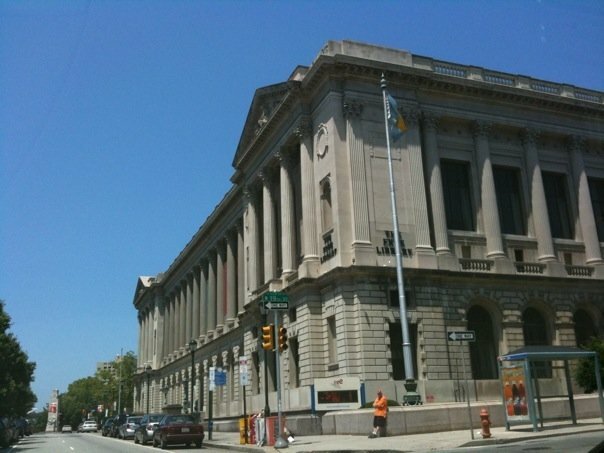 A taxi from PHL to Center City will cost you $28.50. To travel into the city by train, take the R1 line, which will cost you $6.00 to Suburban Station, the closest regional rail station to the library. 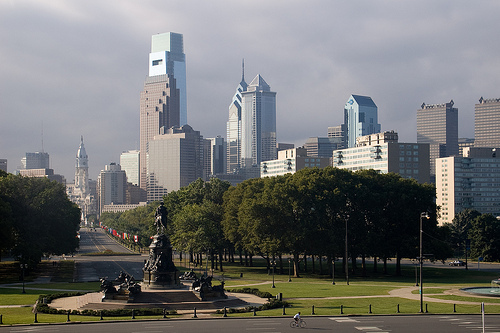 Founded in 1682, Philadelphia is home to much American history and one of the greatest television shows of all time. You can do historical touristy things like see Independence Hall, the Liberty Bell, the Constitution Center, and many other spots. 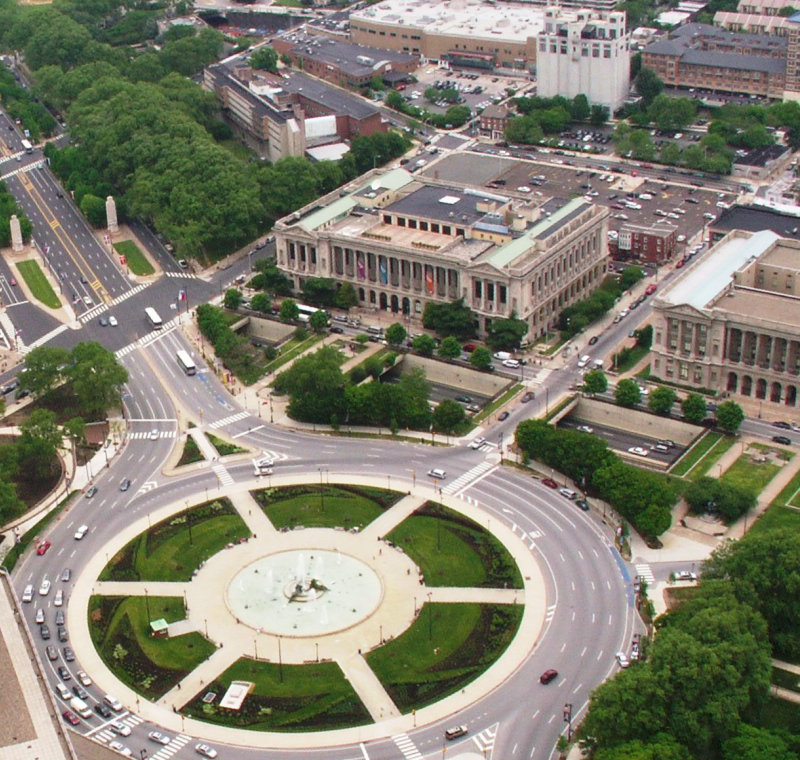 Or do contemporary touristy things like explore the rivalry between Pat's and Geno's or run up the steps of the Philadelphia Museum of Art. Check out the creepy dead people at the Mütter Museum. We've spent many fun nights listening to rock bands at the Khyber (RIP many other dead rock bars we used to frequent), hanging out at the Irish Pub, and having drunken bouts of karaoke upstairs at Yakitori Boy. We've done a lot of walking up and down South Street (Amber used to live near 12th and South) and a lot of feasting in Chinatown. We've spent days and nights in and around the beautiful Rittenhouse Square Park and rainy days inside Reading Terminal Market enjoying the selection of food and vendors. Philadelphia has a healthy Vietnamese population, most of which resides in South Philly along Washington Avenue where there are many restaurants and shops. We've been there with Duc's parents many times, eating at Nam Phuong or getting baked goods at Ba Le. Philadelphia also has some of the best vegan restaurants in the country, from the upscale at Horizons to the pizzas at Gianna's. We've enjoyed many brunches with Amber's (newly vegan) mom at Mi Lah and Govinda's. Our vegetarian guests should make it a point to check out a few of these great places.